We have learned that this visit wasn't as meticulously planned as we had expected. Though I already have gotten used to the fact that most Saudis operate on a scale of time much different than my own, this fluidity in our itinerary surprises even me. I suspect that, upon careful reflection, most Saudis would say that insha allah, or "God willing," is their favorite phrase. It is used anytime a plan has been made, recognizing that any event is up to God and therefore subject to change. In America, generally, if we say something is going to happen, we make it happen, but on this trip, plans can be made or broken without issue. This is just one minor way we have to change our attitudes to fit the culture of our host country. We are now well settled into our rooms and are definitely appreciating the expenses paid by the Saudi government. Our rooms are great, with lots of room and mirrors for precise hijab-checking. At noon, we met and ate together. I should take a picture of the expansive spread we have available for lunch each day. My plate was covered, yet I still got to finish with some baklava, walnut pastry thingies, and a new dessert called Om Ali, a soupy, warm mix of what I think was shaved coconut. From the 4th floor, we have a good view of downtown Riyadh. Now, we will visit a nearby mall attached to the Kingdom Center and have a traditional Saudi dinner. I fear that this could involve eating sticky rice with my fingers. Maybe I can persuade the waiter to slip me a fork when no one's looking. Until then! 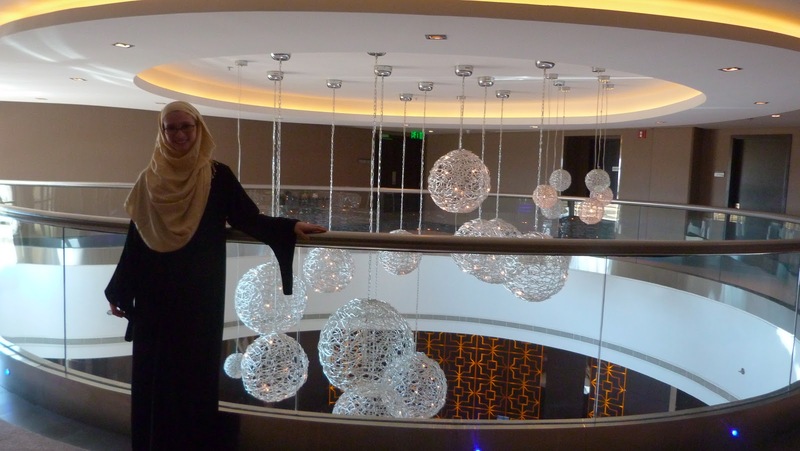 Me on the second floor of our hotel--Saudis have the best taste in light fixtures. Enjoying the pictures of the architecture! Looks like you're having a wonderful time already!